Welcome to iHear®, the internet-based program changing the lives of children who are deaf or hard of hearing since 2011. This innovative program began in 2011 as a way to help every child, everywhere receive listening and language services. iHear features unique video conferencing software, delivered over a secure, high-speed internet connection to bring your child one-on-one, real time therapy sessions with a St. Joseph Institute for the Deaf educator. We’re breaking down barriers, and bringing therapists into your home, or wherever you need them. Harness the power of iHear for your child! Since its introduction, iHear has gained a reputation for producing results for children with hearing loss. 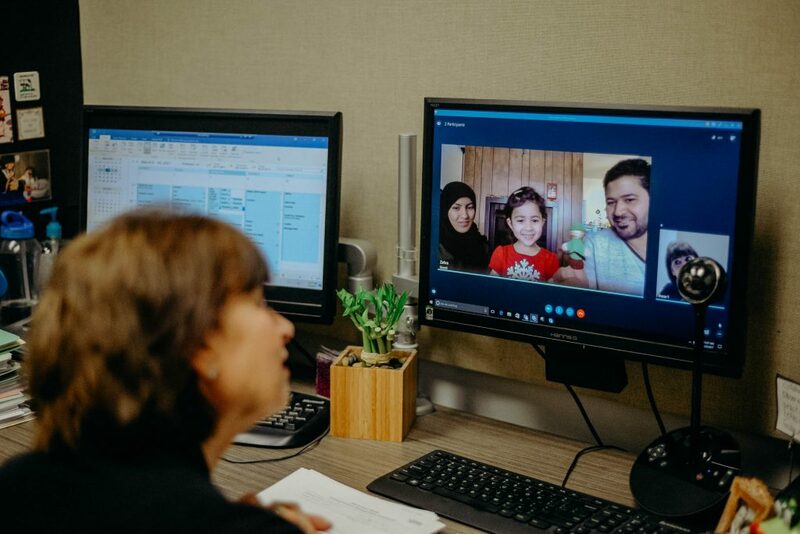 Because iHear’s real-time, secure video-conferencing software replicates an in-person therapy session, iHear therapists are able to build close relationships with children and their families through the personalized sessions. In addition, with the parent in the role of coach, therapy is very hands-on. Nearly 20,000 sessions later, we can see the progress of children in the program. The chart below shows the effectiveness of iHear on children who have used the service consistently. We collect the standardized scores for children enrolled in the iHear program according to iTOTS (our trademarked evaluation protocol). The results of the assessment are detailed in the chart below. The graph demonstrates the listening and language skills that the children enrolled in the program displayed after six months. 100% of children age 0-6 increased their growth scores (dark blue bar), 83% of children age 7 above (light blue bar) increased their growth scores. 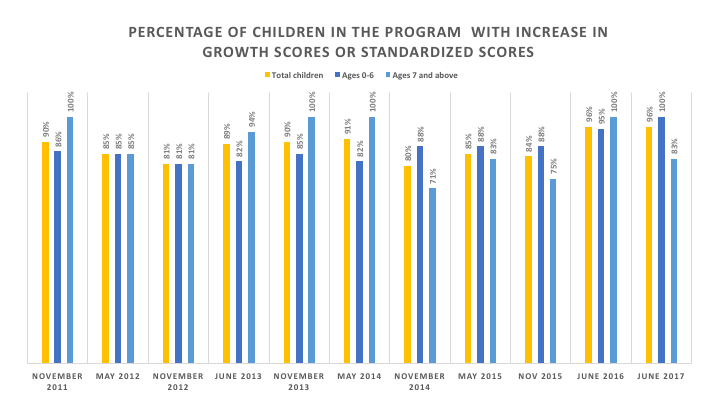 Overall 98% of all children (yellow bar) enrolled in the iHear program between June 2016 and June of 2017 increased their growth scores according to standardized assessments.